This week’s Throwback Thursday pic was taken in 1928 of the recent opening of the addition to the C. H. Smith Department Store, a Windsor institution. The store named after its founder Charles Henry Smith opened his first store in 1914 on Pitt Street East. 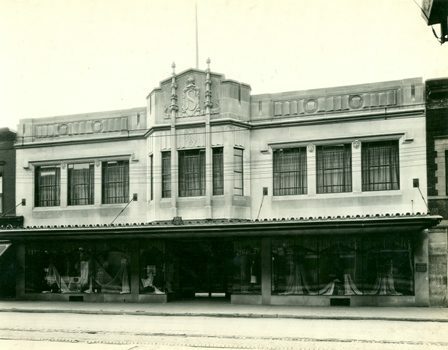 In the early 1920s the store opened a location on Ouellette avenue that served as its main entrance. At one point C. H. Smiths had three locations in downtown Windsor and locations throughout Essex County. Charles H. Smith passed away in October 26, 1964. Unfortunately, shopping trends were changing in the Seventies with growth of national chain department stores and the opening of Devonshire Mall in the early 1970s, the C. H. Smith Department Store closed its doors for good in 1976. If you are interested in viewing this or other photographs of Windsor, please visit the library’s digital exhibit “Windsor’s History and Pictures” at http://heritage.windsorpubliclibrary.com/index.php.